Here's the scoop on the 6 new flavors of the day coming to Culver's! 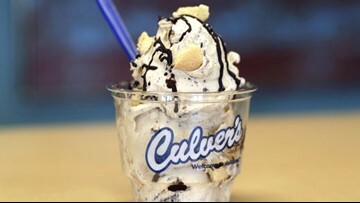 For the first time since 2012, Culver's will be dishing out new frozen custard flavors of the day. - Cappuccino Cookie Crumble, May 10. Frozen custard blended with cold brewed espresso and mixed with crushed sugar cookies and swirls of novelty chocolate. - Blackberry Cobbler, June 10. Cinnamon granola crumble, blackberries and vanilla frozen custard. - Chocolate Pretzel Crunch, July 10. Chopped Bavarian pretzels, novelty chocolate and salted caramel blended into the vanilla custard. - Peanut Butter Cookie Dough, Aug. 10. Brand new peanut butter frozen custard mixed with roasted peanuts and chunks of chocolate chip cookie dough. - Dark Chocolate Decadence, Sept. 10. 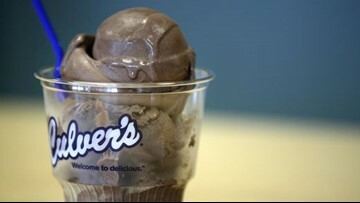 The first-ever dark chocolate frozen custard at Culver’s made with a blend of four cocoa powders. - Peanut Butter Salted Caramel, Oct. 10. Peanut butter custard, roasted peanuts and ribbons of salted caramel. Cappuccino Cookie Crumble, May 10. Frozen custard blended with cold brewed espresso and mixed with crushed sugar cookies and swirls of novelty chocolate. Now, for those of you sticking with this story past the flavors listing, here's your reward: An inside scoop on how these flavors came about and tasting note highlights. I made the trip to Culver's headquarters in Prairie Du Sac to talk — and taste — frozen custard with Quinn Adkins, the company's director of menu development. All six flavors making the grade for this year's release were created, tasted, reformulated, tasted again and vetted by the Culver's menu development team before a Sweet 16 of finalists were tasted and scored by an independent panel of 150 potential guests. Culver's new Flavor of the Day, Chocolate Pretzel Crunch, will debut July 10. 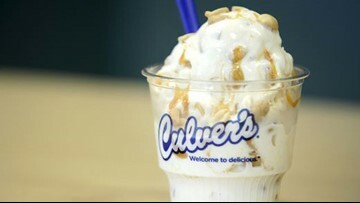 Culver's new Flavor of the Day, Peanut Butter Salted Caramel, will debut October 10. It's a process, says Adkins, that will allow Culver's to release new flavors more often. He's already focused on a new batch for next year. It took 18 months of research and development to make Dark Chocolate Decadence, well, dark. Add dark chocolate cocoa to the custard mix before running it through the machine and you get a cup of gray frozen custard. It delivers the dark chocolate flavor, says Adkins, but not the color. That's because the color we associate with dark chocolate develops at a lower temperature than serving temperature of frozen custard. 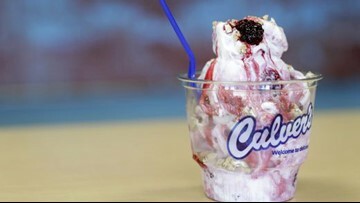 Because frozen custard at Culver's is made in small batches, on-site, freezing the custard to develop the proper color wasn't an option. Nor was adding food dyes, says Adkins. So he began experimenting with adding additional cocoas. When he landed on the right blend of four cocoas and gave a sample to company co-founder Craig Culver, Adkins was rewarded with a hug. As a bonus, if you allow Dark Chocolate Decadence to melt and linger, you will pick up multiple layers of chocolate flavors. Originally I thought the Blackberry Cobbler was my favorite, but the more I think about it, Sept. 10 feels like a long wait to get another scoop of Dark Chocolate Decadence. In the interest of full disclosure, I usually prefer fruit and nut desserts like Blackberry Cobbler over the ooey-gooey, chocolate and candy-laden flavors, so it's no surprise that I took to that one. But the company's taste-testers also backed my impressions of this flavor. Blackberry Cobbler, says Adkins, had the largest reach among testers. Berry tartness blended with creamy vanilla sweetness. What's not to love? A hint of cinnamon and crunch from the granola are nice touches. While it didn't take 18 months to develop, Adkins tried 15 different granolas before finding the perfect addition. Chocolate Pretzel Crunch is built with some of Adkins' favorite flavors. Think dipping chocolate covered pretzels into frozen custard. They're some of my favorites, too. There are sizable pieces of Bavarian-style pretzels adding a savory layer to the salted caramel, and sweet custard. 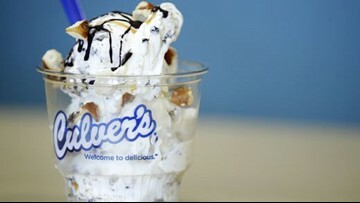 Culver&#39;s new Flavor of the Day, Chocolate Pretzel Crunch, will debut July 10. Cold-brewed coffee gets blended into the custard mix, giving the Cappuccino Cookie Crumble a coffee-flavored base. The result is coffee flavor without any bitterness. Tiramisu inspired this combination and was named accordingly until the test panel gave the name a thumbs down. Thus the name change. Peanut butter lovers, you get two hits this year that's built on a new method that mixes the peanut butter sauce topping into the custard mix. Thus every bite delivers peanut butter flavor. Adding roasted peanuts to both the Peanut Butter Cookie Dough and Peanut Butter Salted Caramel kicks up the peanut flavor. One last interesting takeaway from my afternoon of tasting and talking frozen custard with Adkins is that the local franchises have a lot of control over when to offer the new scoops and even how to make them. If you miss your shot at a new flavor on the release date, you'll just have to wait for your local franchisee to decide when and how often to mix it in as a flavor of the day option. And there isn't an exact recipe for making any of the flavors of the day. At each of the more than 650 locations across 24 states, the folks making your custard are following guidelines, making each scoop a unique tasting experience.